.....Nothing is known of Horatia personally. In the space of 7 years, she gave birth to only two children and died the same day the last arrived. This suggests she had difficulty with pregnancy in general. Oral tradition has it that there were complications during Horatia Jane's birth and a doctor was called to help. He arrived drunk and useless, so was put to bed. She is buried in the churchyard of Old St. Edward's Cemetery in Clementsport. 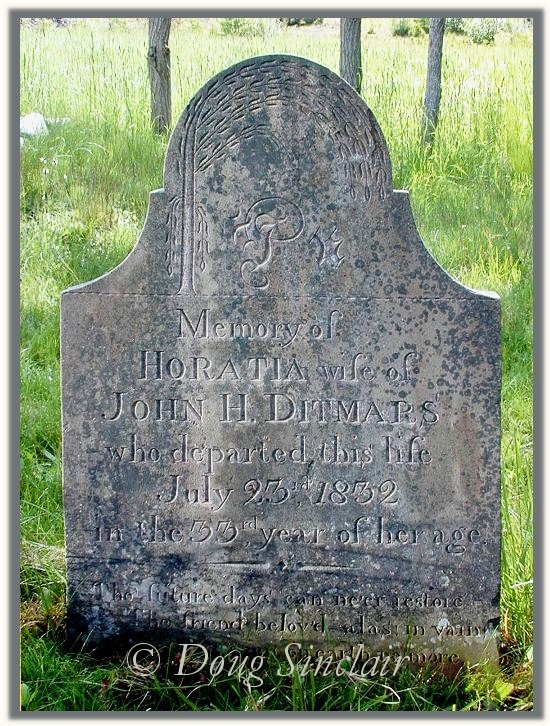 Horatia's birth is estimated from her gravestone, which is also the source for her death date. Her marriage is recorded in the records of All Saints Anglican Church, Granville, NS.